Home Latest Stories Rajnath presides second meeting to discuss election manifesto. Rajnath presides second meeting to discuss election manifesto. 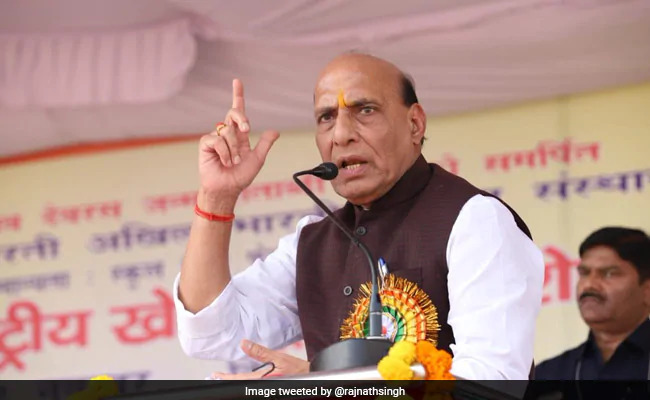 Full throttle preparations for the general elections have started for the saffron camp with the BJP Election Manifesto Committee holding its second meeting on Tuesday under the chairmanship of Union Home Minister Rajnath Singh. Among others, Minister of State for Home Kiren Rijiju, MoS for Prime Minister’s Office Jitendra Singh, Minority Affairs Minister Syed Abbas Naqvi, BJP’s Rajya Sabha member Rajeev Chandrasekhar and former Jharkhand Chief Minister Arjun Munda attended the meeting. Mr Rajnath, who was party president during 2014 Lok Sabha polls, held similar consultation on Monday with Union Agriculture Minister Radha Mohan Singh and Defence Minister Nirmala Sitharaman and discussed among others issues related to agrarian matters and farm distress. The party has formed various sub-committees to look into various socio political and also foreign policy matters and have sought inputs from people to be incorporated in the party manifesto. The sub committees have been asked to hold talks with different stakeholders and seek feedback from them on what needs to be done after Prime Minister Narendra Modi’s government returns to power, a party source said. BJP chief Amit Shah held consultation with senior leaders on various issues of poll preparedness, sources said. Finance Minister Arun Jaitley also held discussions with party spokespersons on Monday. Previous articleIndia & Saudi Arabia to work together for taking ‘irreversible’ steps against all terrorists. Next articleHafiz Saeed & Salahuddin financial conduit Zahoor Shah Watali property attached by ED.